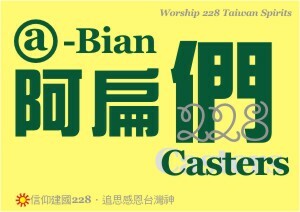 The promotion of the “Worship Tâi-uân-sîn” movement began at the year of 2004. It can be better described as the stage of a social movement. The main focus of the stage is to preaching the truthfulness of “Worship Tâi-uân-sîn” on the street. After 2007, the priority of the movement was gradually shifted to establish an education center (i.e. a permanent base) for the faith of 228 Tâi-uân-sîn. The center is now being called the “Taiwan Holy Mountain - Ecological Education Park”. 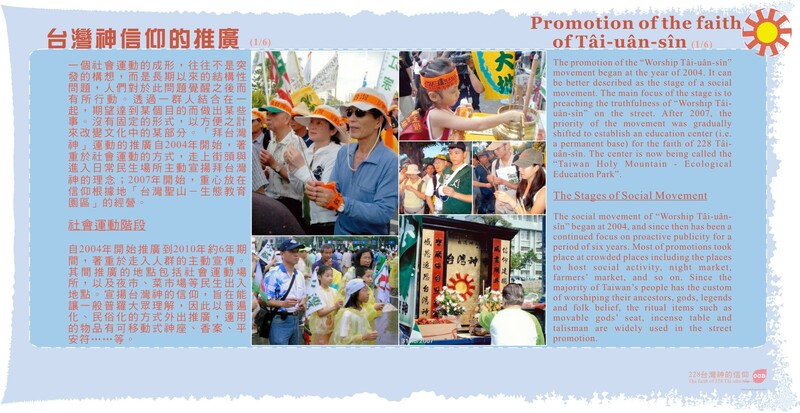 The social movement of “Worship Tâi-uân-sîn” began at 2004, and since then has been a continued focus on proactive publicity for a period of six years. Most of promotions took place at crowded places including the places to host social activity, night market, farmers’ market, and so on. Since the majority of Taiwan’s people has the custom of worshiping their ancestors, gods, legends and folk belief, the ritual items such as movable gods’ seat, incense table and talisman are widely used in the street promotion.